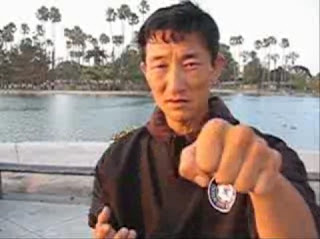 Martial artists often talk about the the "flinch reflex". Some insist on "training it out" or "getting over it" (if that is at all possible - more on that later). Others like Tony Blauer talk about the need to "transform" this reflex - ie. to harness it and turn it into a productive reaction rather than an essentially submissive one (see his "SPEAR" methodology). With due respect to Mr Blauer and others like him, I think the traditional martial arts have many hundreds of years head start on this idea. In this article I propose to show just how traditional techniques build on the flinch reflex so as to create a supremely effective response in civilian defence scenarios. What is the flinch reflex? "The flinch response is an unconscious response to a perceived threat. Throughout human history, this survival mechanism has protected countless people from serious injury, blindness, and death. Basically, when the human body perceives a threat, the body responds to ward off the threat through a series of reflex actions. The most noticeable reflex is the defensive motion of the hands and arms, but the flinch response can also include blinking, squinting, jumping, and withdrawal." The video below is also quite accurate in describing the flinch reflex. an evasive movement by the body. The first part of the flinch - the defensive motion of the hands - is usually understood as some sort of "covering up" action, but in reality it could be practically anything. In my experience as a prosecutor watching countless surveillance videos of actual assaults, the defensive motion more often consists of one or both arms shooting out - not covering up. Even my 4 year old daughter's flinches don't involve a "cover". Just today I took her to the park and we were throwing a ball. Unfortunately she is inclined to panic when things get near her face. So she closes her eyes, pulls her body back and shoots her arms out, ram-rod straight in front of her. In other words, the first feature of the flinch might just involve the arms trying to ward off an attack - rather than an attempt to "cover up" against it. Musician Glenn Danzig exhibits a flinch reflex against a punch. Note his defensive arm movement. The second feature of the flinch - evasive body movement - is something to which I think we can all relate. We physically flinch away from danger. This can take the form of a highly submissive "shrinking" or "cowering" motion. In others it manifests as nothing more than a backward lean. Certainly Danzig shows that he is far from a "shrinking violet" in that his flinch reflex involves only the slightest lean. It is with some interest that I noted that the first video I've embedded above only contains one "genuine" flinch - and that is at the very beginning, when the assistant didn't know what the presenter was about to do. 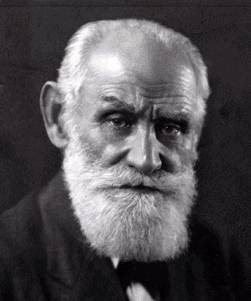 What was his finch reflex? To lean back. Afterwards his "flinches" were clearly rehearsed and these defaulted to some sort of "faux cower". So it seems to me that unless you are highly submissive by nature, you shouldn't expect your flinch reflex to default to a cowering, face-covering response. Unfortunately this is precisely what most people who teach "transforming the flinch reflex" wrongly assume. a movement of your arm or arms upwards and outwards towards the threat. If this is sounding familiar it should be. In a nutshell the typical flinch response is an attempt to evade an attack while intercepting/deflecting/parrying/blocking it. In other words, humans will naturally default to what I believe is the mainstay of traditional civilian defence arts, and that is "blocking with evasion". More on this in a minute. A typical method for "transforming" the flinch reflex. Note how there is an assumption that the flinch reflex will involve a "cower" with the arms near the face. This might well be representative of submissive people, but I get the feeling it has very little to do with the average young man, never mind a trained martial artist. So how should one go about transforming the flinch reflex into something productive? Boxers, kickboxers and savateurs - in fact all combat sports practitioners - have been doing so for years. Their answer lies almost solely in developing the skill of evasion. To do this they utilise the second part of the flinch reflex - the evasive body movement - and train it into an effective response; one that allows them to "re-enter the game". Their lack of emphasis on the first part - the defensive hand motion - is understandable; gloves make it very difficult to use forearm deflections. Simply put, the gloves get in the way. 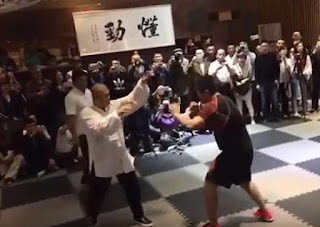 Gloves have fundamentally changed the dynamics of combat sports relative to unarmed fighting, as I've discussed in my article "Evasion vs. blocking with evasion". 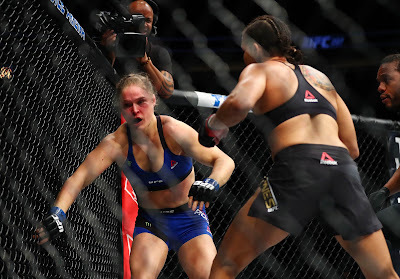 Yes, boxing and related combat sports do employ parries, checks and other defensive hand movements. However more often than not, any defensive hand move takes the form of getting the gloves to provide a simple physical barrier. Essentially these sports choose not to focus on the first element - the defensive hand movement - and rely instead on the second element - the evasive body movement. They have taken this evasion and elevated it to an art form. Ducking, weaving, bobbing, leaning, slipping... boxers have as many terms for evasion as the Inuit have for snow, precisely because they are so good at it. 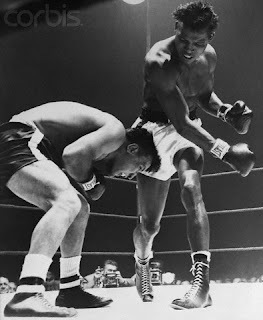 Take a swing at a boxer and chances are he won't "flinch" by covering up. He'll duck and hit you back. Consider the video below and note how the boxer has honed his own "flinch reflex" into a highly productive reaction. A boxer shows just how productively he has honed his own "flinch reflex". Note his ducking and even his defensive use of his hands. 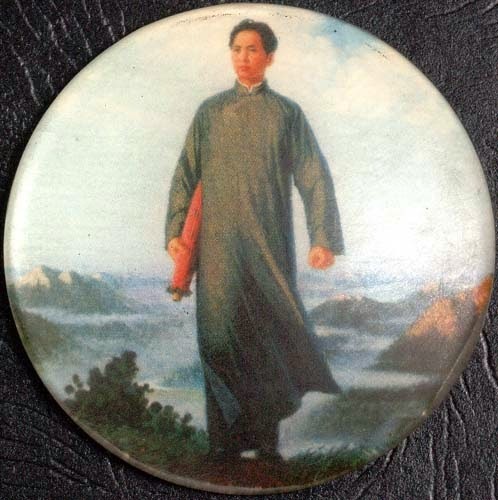 What about the traditional eastern martial arts? They use both evasion and what I have called "blocking" - ie. the use of the forearm, hand, elbow, shoulder etc. - to deflect an attack by intercepting it and redirecting it. In addition to the arms, deflections can be effected using the legs and other parts of the body too. But it is the very nature of the flinch - and it's defensive hand motion - that means that hand/arm deflections will be your body's default response. 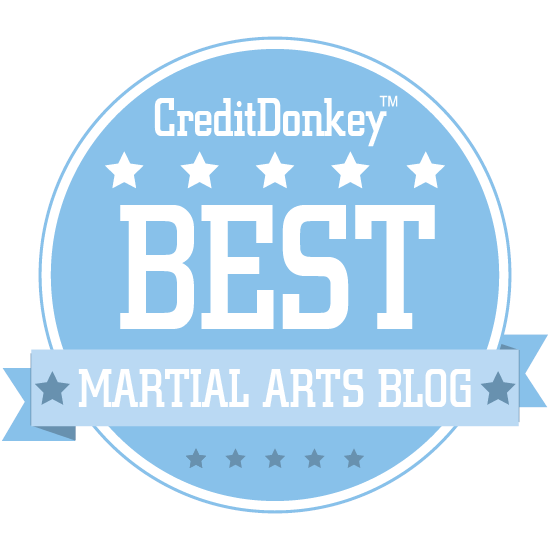 Many martial artists today are want to talk about harnessing the flinch reflex. However there is a general reluctance to look at the hundreds, if not thousands, of years of traditional martial arts development. 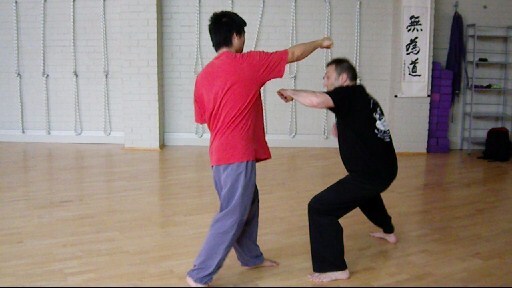 Instead of looking as far back as the ancient Greeks (never mind the plethora of Chinese and Okinawan systems) to see that arm deflections and evasion can and should be used together, some people seem overly keen on creating new systems of self-defence, based on flawed assumptions about the flinch reflex and the suitability of combat sport methodology in civilian defence scenarios. To point out that it is not ideal to be "on the back foot" is to point out the obvious. The statement that it would be preferable to dictate the terms of a conflict in no way affects the possibility - in fact, the probability - that this luxury won't be open to you, at least initially and certainly not in every case, in a civilian defence scenario. Training to "take the initiative" from the "get-go" is a good idea, but I wouldn't be putting all my eggs into that one basket. As far as I'm concerned, there is nothing "reality-based" in an approach that fails to consider reactive defence. It denies both the reality of human nature and of conflict itself. Put another way, a policy of "seizing the initiative" doesn't make reactive skills redundant. On the contrary, your ability to "seize the intiative" will often depend upon reactive skills. Some people say they have learned not to flinch. Rather than "react", they "act". This is a concept often aligned with the "seizing initiative" school of thought. I am skeptical whether such a thing is at all possible. I think the flinch reflex has a lot more to do with our genetic programming than learned behaviour. And genetic programming isn't easy to "unprogram". The flinch reflex is more akin to classical or Pavlovian conditioning (eg. saliva in your mouth when you expect food) than it is to operant conditioning (learned responses). Yes - people recoil from danger once they learn danger is present. But what they have learned is the existence of the danger - they haven't learned to recoil. So when a child touches a hotplate that is on, he or she will recoil sharply. And the child will recoil the next time he or she absentmindedly puts a hand close to the hotplate - whether it is on or not. The child hasn't learned to recoil. The child has learned the hotplate is dangerous. The recoil is instinctive. I'd hazard a guess and say that unlearning a flinch is about as hard as unlearning your reaction to pull your hand away from a hotplate - or unlearning your tendency to salivate in the imminent expectation of food. These are autonomic responses, not learned ones. Clearly, people can unlearn the tendency to flinch in certain situations. So, for example, I learned not to flinch when my sensei demonstrated on me - sometimes with a live blade or other weapon. I learned to trust him and not to flinch in that instance. But I didn't unlearn the flinch reflex: what I was unlearning was just a situational flinch. There is a big difference. If a stranger attacked me with menace using the same weapon, I'd respond very differently to how I did as "uke" in the dojo. At least, I hope I would. So I'm skeptical of unlearning the "flinch reflex". I think people can modify the nature of their flinch, but not the very tendency to "recoil from danger" when surprised. People can even modify the flinch reflex so as to "enter" or move forwards. This is consistent with traditional martial arts techniques, particularly at an intermediate or advanced level, where forwards (or at least forwards-angled) taisabaki or tenshin (body movement or evasion) is taught as a response to attack. And clearly people can be taught what my friend Bryson Keenan calls "stress inoculation". Not reacting to things when you don't need to (ie. overreacting) is one thing. Learning not to react when something is about to enter your eye (as opposed to whizzing past) is another. I don't know whether you can - or why you'd want to! certain "reality-based" practitioners who draw their inspiration from either combat sports practitioners or "kata revisionists" or both. Yet when you look at it objectively, the flinch reflex is entirely compatible with the traditional approach of using defensive hand movements with an evasive body movement. 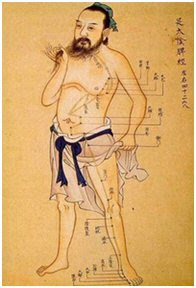 All traditional eastern arts do is attempt to shape the flinch reflex into something more productive. Because denying the flinch reflex is pure folly. 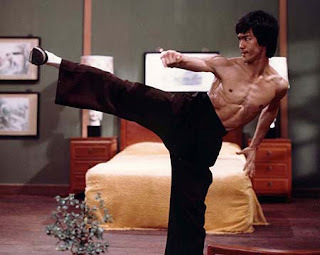 Millenia of evolution can't be overwritten by a few martial arts classes - or even decades of them. When you are surprised, you will flinch. To assume that you won't (be surprised or flinch) is just wishful thinking. 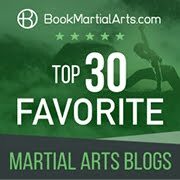 "Most martial artists learn blocks (and passes and parries, etc.) and evasions (ducking, slipping, weaving, bobbing, cutting the line...). For the most part, these are ineffective. Not because the actions are inefficient or the movements don't have a valid application, they are ineffective because of timing, because they are reactive." I have great respect for Mr Miller and follow his blog. But I don’t agree with this statement. I don't think blocks and evasions are ineffective. Anything that helps you is effective. It's true that some sort of misguided ideology/methodology that says “always start with a block even if you don’t have to” is going to be ineffective. So is a policy of “keep blocking endlessly”. But I don't know anyone who adheres to such ideas. I certainly agree with the principle that one must "seize initiative" as soon as possible; I just think that you might just have no choice but to "react" before you can "seize initiative". is inaccurate insofar as it seems to imply that you don’t need blocks or evasions (which you clearly do in some cases). 2. Curiously, while Mr. Miller argues against "reactive" strategies, it is clear from this post that he too trains the to modify the flinch reflex. And the flinch reflex is nothing if not reactive. You don't "flinch" unless you are reacting to something. You certainly don't "flinch" when facing someone who might be an attacker but who hasn't done anything yet. If you do something in such a case, it isn't a "flinch". Accordingly it seems to me that Mr Miller and I are not really very far apart in our thinking. More than likely Mr Miller simply has a different point of emphasis. What I think we both disagree with is the apparent use of blocks and counters as separate, disjointed techniques. Rather, blocks and evasions (where they are necessary) should seamlessly integrate with an appropriate counter as soon as it is possible to do so. My opposition to extraneous hip movement is precisely because it isolates blocks and prevents them feeding into a counter - ie. it prevents them being part of a linked, flowing response that is as much "one move" as is possible in the circumstances. Great post Dan (as usual). An excellent post and examination of the flinch response. Your content rings true and is an often overlooked area in self defense. This is especially interesting to me as I have been working on developing a knife survival system designed for the average joe, and modifying it somewhat for law enforcement and security. Actually, the physical techniques don't change, but the approach to, or more accurately, the exit from the situation does. In many of the commercial systems out there, the techniques usually center around knowing you're in a knife fight. Obviously, that's not always the case (especially with easily concealed weapons). I've been working on utilizing the flinch response in the training with a fair amount of success. One thing I have noticed is that the generally accepted 'hands up to the face' only seems to be instinctive once someone knows some form of attack is coming. The 'shooting the hand out' towards the threat you mentioned, seems to be the initial response the first time I feign an attack with a knife. You also see this in aggressive sparring or boxing with non professional fighters. I've been tweaking my techniques to properly address this 'first time response' and your post has given me some material to help explain the reasons why the training is structured the way it is. Martial arts attempt to harness the powerful flinching reflex by refining the instinctual defenses of the body. The muscle memory that comes from the many hours of bunkai or kumite also contributes to taming the fear factor behind the flinch affording one those precious micro seconds to assess the situation. You often mention the melee zone where the probability of being hit is high and flinching may be mortal. The eyes must always focus on the foe (remember those head rolls with the focus on a point straight ahead? ), and accept (absorb) the blows something like sacrificing pawns to catch the knight. In the end it is all in the eyes and how one “looks”. This can be trained. One of the basic tenets of the kata is to know where your eyes are, attack follows the eyes, the eyes look for intent in order to preempt. You cannot deny the flinch, you must work with it. Wow! Just found this article via the Journeyman's site. Very well done. I especially find where you discuss a flinch as not being about covering ones face and head with the arms and hands but pushing them out forward as very interesting. It does ring true I feel. I am not completely sold that it happens all of the time, but I will definitely be keeping this in mind when looking at video of people in real fights and surprise situations. Thanks for the education! Thanks Adam. I'm sure that the outward reaction is common, even though it doesn't happen all the time. Much depends on the nature of the attack and other circumstances. The assumption that it is always a cover of the face is, in my view, clearly wrong. Have only found your blog recently, but it's added tremendous value to my training. Thanks. I like Rory Miller's stuff too, and recently took the time to read back through his blog (and his books) from the beginning. I'm not in a position to speak for him, but I think his distrust of 'reactive training' (parries, blocks) stems from the belief that they are learned techniques that are outside of the flinch response. After I read your break-downs of blocking elsewhere on this block (especially chudan uke), I started to look at blocks/deflections under quite a different light. Specifically, I hadn't realised that blocks could (should) incorporate a 'reaching' motion in order to make contact with the attacking limb and then starting to apply torque, as opposed to being a half circle attempting to intercept the limb and apply force as the attack passes through the plane of the block. Once I started to incorporate the 'reaching' component of a block, the whole movement felt more precise, accurate, safer, and natural. Of course, this 'reaching' component can be provided by the 'flinch' response if your post here is correct. So I would suspect that Rory isn't aware of the ways in which traditional blocks can be integrated with the flinch response. I think he's quite right to argue that karate blocks (as you would be taught them at the local karate club, relying on hand-eye coordination and timing) are slow, and dependent on timing and forewarning that you probably won't have in a civilian defense situation. But once we factor in your findings (e.g. that chudan uke is basically a flinch response with some structure and torque at the end), then they become just as feasible as any other flinch response. 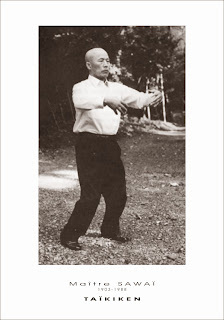 Recognising this, I also now view the handwork from Sanchin in a different light: I've always assumed that we are punching as we extend our hands in the kata, but perhaps we are instead reaching (flinching), intercepting, and deflecting. In that case, sanchin = chudan uke. Great post, great blog. I'm learning a lot here. Thanks again. Thanks for your insightful analysis Michael. I agree with what you've said. I also agree with most of what Rory says. 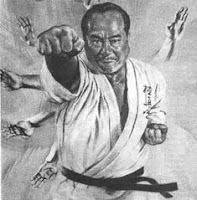 Indeed, the way karate or other traditional "blocks" are often interpreted makes them susceptible to the kinds of criticisms that people make. My entire approach has always been different from these, based on how I was first taught by my teacher. So I have partly "made it my mission" to explain them here. I'm glad you find my efforts useful! Thanks for reading, for your contribution and your encouragement.